Wesley Beth Reiss, D.O. is a holistic physician specializing in Traditional Osteopathy, a comprehensive form of manual medicine that works to find and correct the true underlying causes of disease and dysfunction. With a physician’s full understanding of the body, Dr. Reiss can locate small irregularities in the anatomy - interruptions in movement and flow that arise from everyday physical and emotional injuries - by touch. She then applies gentle manipulation wherever needed over the entire body (bones, muscles, organs and all connective tissues) to restore normal structure. By removing restrictions to full motion and releasing old traumas locked inside the tissue, the circulation of vital fluids is improved, bringing back to ailing areas the body’s own powerful healing abilities. Dr. Reiss also practices Cranial Osteopathy, an extension of traditional Osteopathic Manipulative Medicine, which can balance and improve the function of the central nervous system, and through that, the entire body. This aspect of her treatment can make contact with the primary rhythms of the body, allowing her to bring forth the deepest energies and healing forces always present within. 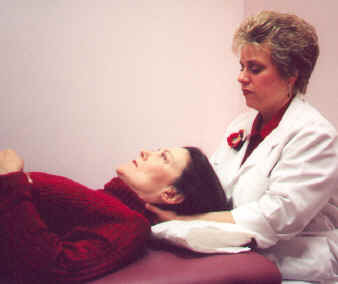 The manipulation practiced by Dr. Reiss is on a more comprehensive and profound level than that used by any other manual specialists, such as physical therapists, chiropractors or massage and cranio-sacral therapists, who sometimes use simplified techniques isolated from Osteopathy. As an adjunct to her Osteopathic treatment, Dr. Reiss counsels patients on nutritional, exercise, stress management and lifestyle modifications to aid recovery, prevent future injury and maintain long-term health. Dr. Reiss also makes recommendations for safe and appropriate supplements. While Board Certified in Family Practice, Dr. Reiss has a chosen to cultivate a specialty holistic practice, and thus recommends that patients continue with their current primary physician for conventional testing and pharmaceutical therapies as necessary. Her practice has been greatly influenced by the work of prominent Osteopath Robert Fulford. Osteopathic manipulation, Cranial Osteopathy, and the special healing techniques of Dr. Fulford are all highly recommended by well-known alternative physician and author Dr. Andrew Weil. Trigger point and Neural Therapy injections, and the prescribing of Low Dose Naltrexone (LDN) are also now integral elements of the practice, as is the prescribing of Medical Marijuana. With a strong emphasis on focused and active listening, Dr. Reiss gives each patient the personal attention and dedicated time needed to fully explore his or her physical, mental, emotional and spiritual well-being. Being a physician Board Certified in Holistic Medicine, she recognizes unconditional love as life’s most powerful healer, and encourages patients to release the toxic consequences of hostility, shame, fear, anger and grief. By using Osteopathic manipulation, nutrition and exercise counseling, and by applying the Principles of Holistic Medicine, Dr. Reiss can help relieve pain, prevent disease, eliminate the need for surgery or other intrusive therapies, and speed the recovery from nearly all medical problems.